To use Abed-1pop, you will have to install NetLogo (free and open source) 6.0.1 or higher and download this zip file. The zip file contains the model itself (abed-1pop.nlogo) and also this very webpage (which contains a description of the model). To run the model, you just have to click on the file abed-1pop.nlogo. The figure below shows Abed-1pop's interface. Abed-1pop is a modeling framework designed to simulate the evolution of a population of n-of-agents agents who recurrently play a symmetric 2-player game defined by a payoff-matrix. Agents use pure strategies only, and they occasionally revise their strategy. By setting parameter n-of-revisions-per-tick, which is the number of randomly selected agents that will revise their strategy in every tick. The payoff that each agent obtains in each tick is computed as the average payoff over n-of-trials matches (where the agent uses his particular pure strategy, and his -randomly chosen- counterparts theirs). whether agents may play with themselves or not ( self-matching? ). decision-method, which determines how to single out one instance out of the set of candidates. Abed-1pop implements the following methods: best, logit, positive-proportional, pairwise-difference, linear-dissatisfaction and linear-attraction. Under imitative protocols, revising agents observe what other agents are doing and their payoff, and use this information to update their strategy. Specifically, revising agents will compile a multiset of n-of-candidates agents to copy the strategy of one of them. The revising agent is always part of this multiset of agents. The selection of the other ( n-of-candidates - 1 ) agents is conducted randomly, so popular strategies in the population are more likely to be observed than less popular ones. 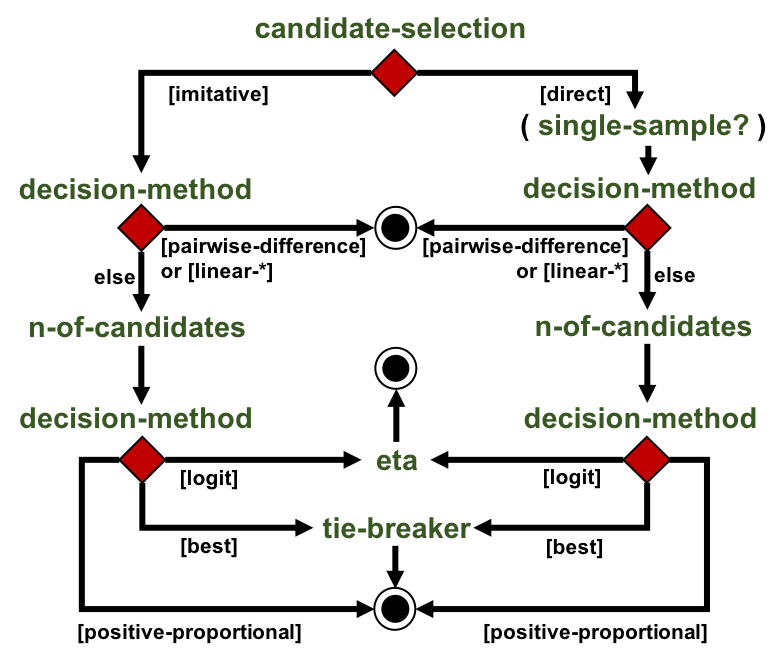 Once the multiset of candidate agents has been compiled, the revising agent will use one of various possible decision-methods (see below) to single out one of the candidates and copy his strategy. In contrast, under direct protocols, revising agents choose candidate strategies directly, so a strategy's popularity does not directly influence the probability with which it is considered. Specifically, the revising agent considers a set of n-of-candidates strategies (including his own), tests them, and selects one of them according to one of various possible decision-methods (see below). 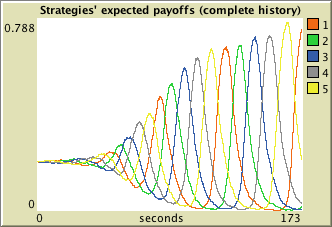 whether the strategies in the test set are compared according to a payoff computed using one single sample of agents (i.e. 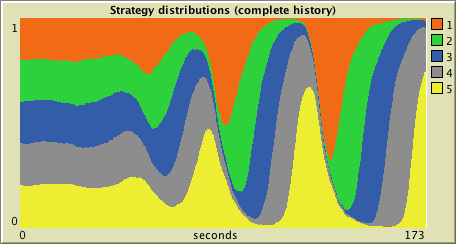 the same set of agents for every strategy), or whether the payoff of each strategy in the test set is computed using a freshly drawn random sample of agents ( single-sample? ). If random-initial-condition? is On, the population will consist of n-of-agents agents, each of them with a random initial strategy. If random-initial-condition? is Off, the population will be created from the list given as initial-condition. Let this list be [x1 x2 ... xn]; then the initial population will consist of x1 agents playing strategy 1, x2 agents playing strategy 2, ... , and xn agents playing strategy n. The value of n-of-agents is then set to the total number of agents in the population. 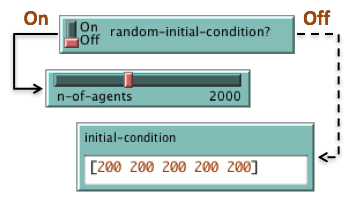 The value of n-of-agents can be changed at runtime with immediate effect over the model. If n-of-agents is reduced, the necessary number of (randomly selected) agents are killed. If n-of-agents is increased, the necessary number of (randomly selected) agents are cloned. If use-prob-revision? 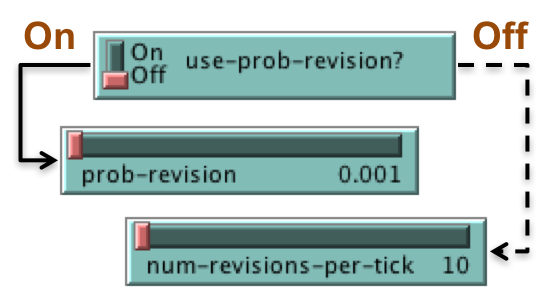 is Off, then n-of-revisions-per-tick agents are randomly selected to revise their strategy in every tick. 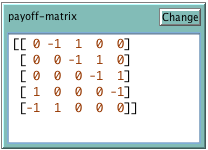 Payoff matrix for the symmetric game. Entry Aij in the matrix denotes the payoff obtained by player row when he chooses strategy i and his counterpart uses strategy j. The number of strategies is assumed to be the number of rows (and columns) in this square matrix. If self-matching? is On, agents can be matched with themselves. If self-matching? is Off, agents cannot be matched with themselves. Everyone, including themselves, if self-matching? is On. Everyone else, if self-matching? is Off. We assume clever payoff evaluation (see PGED, section 11.4.2, pp. 419-421), i.e. when a revising agent tests a strategy s different from his current strategy, he assumes that he switches to this strategy s (so the population state changes), and then he computes the payoff he would get in this new state (i.e. he computes the actual payoff he would get if only he changed his strategy). consider-imitating-self? indicates whether the sample is taken from the whole population (i.e. including the reviser) or from the whole population excluding the reviser. Note that, in any case, the reviser is always part of the multiset of candidate agents at least once. The set of candidate strategies contains the revising agent's own strategy plus ( n-of-candidates - 1 ) other strategies, selected at random. Note that when an agent tests a strategy, he assumes he adopts it, so if the agent himself is part of the sample, he will be playing with himself using the strategy under test. random-walk: This tie-breaker makes use of an auxiliary random walk that is running in the background. Let N be the number of agents in Abed-1pop and let n be the number of strategies. In the auxiliary random walk, there are N rw-agents, plus a set of n so-called committed rw-agents, one for each of the n strategies in Abed-1pop. The committed rw-agents never change strategy. In each iteration of this random walk, one uncommitted rw-agent is selected at random to imitate another (committed or uncommitted) rw-agent, also chosen at random. We run one iteration of this process per tick. When there is a tie in Abed-1pop, the relative frequency of each strategy in the auxiliary random walk is used as a weight to make a random weighted selection among the tied candidates. A random weighted choice is conducted among the candidates. The weight for each candidate is e(payoff / (10 ^ log-noise-level). 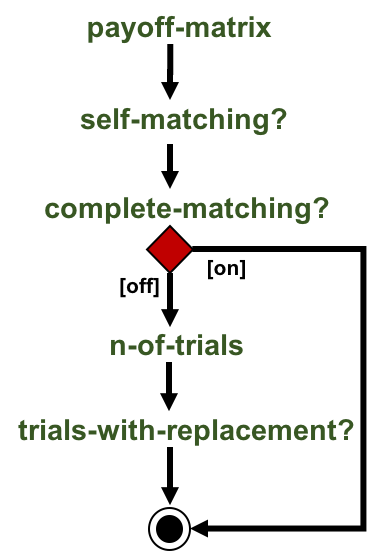 Recall that the payoff for each candidate is the average payoff over the n-of-trials matches. In pairwise-difference, the agent always considers exactly two candidates (one corresponding to his own strategy or to himself, and another one), i.e., the value of n-of-candidates is automatically set to 2. The revising agent will consider adopting the other candidate strategy only if the other candidate's payoff is higher than his own, and he will actually adopt it with probability proportional to the payoff difference. In order to turn the difference in payoffs into a meaningful probability, we divide the payoff difference by the maximum possible payoff minus the minimum possible payoff. If complete-matching? is On, the mean dynamics for large populations of the imitative linear-dissatisfaction protocol (sometimes called imitation driven by dissatisfaction) is the replicator dynamics up to a speed factor (see Weibull (1995, section 4.4.1, pp. 153-5) or PGED, example 5.4.3). If complete-matching? is On, the mean dynamics for large populations of the imitative linear-attraction protocol (sometimes called imitation of success) is the replicator dynamics up to a speed factor (see Weibull (1995, section 4.4.3, pp. 158-60) or PGED, example 5.4.4). , a window pops up to allow the user to load a parameter file in the same format as it is saved by Abed-1pop. 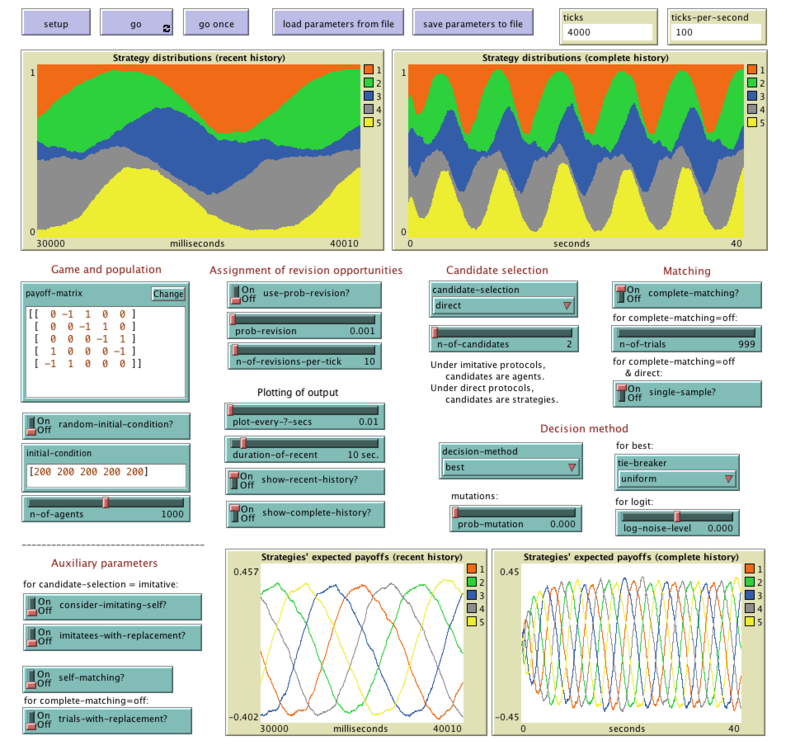 Each of the two types of plots described above comes in two different flavors: one that shows the data from the beginning of the simulation (labeled complete history and active if show-complete-history? is On) and one that shows only the duration-of-recent last seconds in the simulation (labeled recent history and active if show-recent-history? is On). Abed-1pop (Agent-Based Evolutionary Dynamics in 1 population) is a modeling framework designed to simulate the evolution of a population of agents who play a symmetric 2-player game and, from time to time, are given the opportunity to revise their strategy.